Armed Russian security forces did not allow activists to the site of holding the event, dedicated to the 30th anniversary of mass rallies of Crimean Tatars in Moscow in the summer of 1987. In the occupied Crimea, armed Russian security forces blocked a recreation center, where commemorative events of Crimean Tatars were to take place on August 20, the Head of the Mejlis of the Crimean Tatar people, People's Deputy of Ukraine Refat Chubarov informed on Facebook. According to him, several dozen armed masked men and Russian police blocked the entrance to the recreation center "Cowboy" in the village of Ak-Kaya (White Rock) near the town of Karaasuvbazar (now Belogorsk). The reason for blocking the territory of the recreation center, announced by the Russian invaders, was the allegedly received message about an "arms cache" on the territory of the base. “Today at 12:00 on the territory of the recreation center "Cowboy", located near one of the picturesque and historical places of the Crimea - Ak-Kaya, the event dedicated to the 30th anniversary of mass rallies of Crimean Tatars in Moscow in the summer of 1987 should begin. 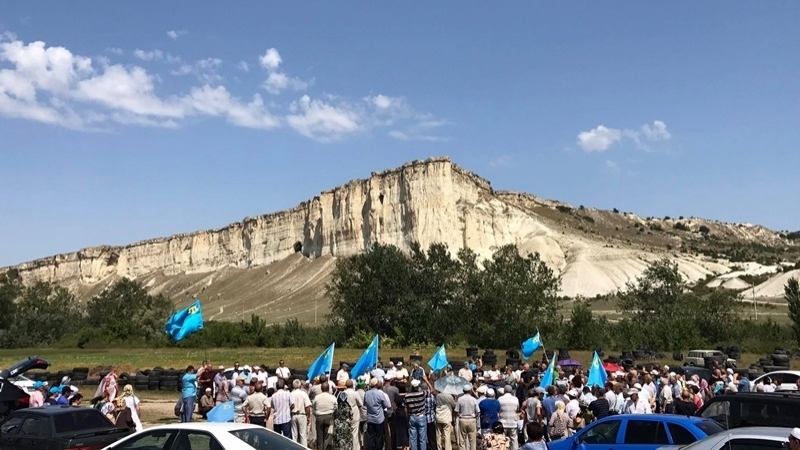 Obviously, the Russian invaders decided to prevent holding a patriotic event in the temporarily occupied Crimea, dedicated to one of the decisive stages of the Crimean Tatar national movement of modern times,” the Head of the Mejlis wrote. Chubarov went on saying that the invaders had detained Bekir Umerov, one of the organizers of the event, a veteran of the national movement, a younger brother of Ilmi Umerov. Despite all obstacles, bans and cordons of the Russian invaders, the Crimean Tatars began their memorial event. "In spite of everything, our flags are fluttering and the old people began to read the dua," Aishe Umerova reported. Participants the event in the village of Ak-Kaya reported an ultimatum from the armed FSB officials. “We decided to start the planned events right in front of the riot police cordon. The old people are reading the dua, the national anthem sounds, Ilmi Umerov is speaking about the Moscow events of 30 years ago,” Aishe Umerova reported. Then the police claimed an alleged "unauthorized event." Participants of the action decided to leave the territory blocked by the armed forces and gather in the courtyard of the Sary-Su mosque in one of the Belogorsk neighborhoods. Later, Aishe Umerova also informed that the occupants released Bekir Umerov detained before the start of the rally.